Modi Visits Japan: What’s on the Security Agenda? A closer look at some of the agenda items on the defense side. India’s Ministry of External Affairs recently announced that Prime Minister Narendra Modi will travel to Japan on October 28-29 for the 13th India-Japan Annual Summit. The fifth annual summit meeting between Modi and Japanese Prime Minister Shinzo Abe will put the bilateral relationship in the spotlight amid wider regional and global changes. 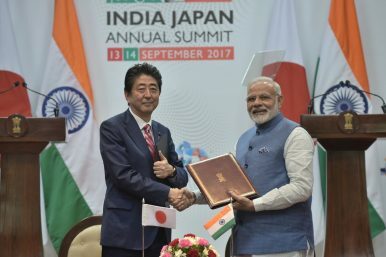 The India-Japan relationship has expanded over the years, and given the rapidly changing strategic dynamics in the Indo-Pacific, the two leaders are expected to further boost and deepen their bilateral cooperation and discuss a range of bilateral, regional, and global issues that impinge on their security. Nevertheless, there are specific areas on defense that will stand out and potentially further elevate the India-Japan partnership. At a broad level, the mutual concern between India and Japan about China is evident, and Tokyo and New Delhi hope to be able to present clear and credible alternatives to smaller nations in the Indo-Pacific on economic and infrastructural assistance. So, in that vein, establishing regional connectivity appears to be high on the agenda for both Abe and Modi. Kenji Hiramitsu, Japan’s Ambassador to India, hinted that there may be certain projects for South Asia that may be announced during the summit meeting. He also added that for the first time, the two armies will exercise together in a joint drill at the Counter Insurgency Warfare School in Vairengte in India’s northeast, in November. The exercise, to be called “Dharma Guardian 2018” will see the participation of 6/1 Gorkha Rifles on the Indian side and the 32 Infantry Regiment on the Japanese side. This will come close on the heels of the just concluded the JIMEX series of maritime exercises earlier this month. Japan will also participate as an Observer at Cope India, a joint air exercise between India and the United States. Defense trade is also an important facet of India-Japan defense ties. Talks to procure the US-2 amphibious aircraft are apparently once again on – the ShinMaywa Industries Limited and India’s Mahindra have reportedly signed a Memorandum of Understanding “to manufacture and assemble structural parts and components for the US-2 amphibious aircraft.” Reports have also suggested that this will feature as an important item during Modi’s visit and that there is willingness on both sides to push the deal through a G2G route. In a particularly significant move, Japan and India are also contemplating the signing of a Mutual Logistical Support Agreement. This agreement, something along the lines of Acquisition and Cross-Servicing Agreement (ACSA), would be strategically beneficial as it would permit the Indian armed forces and the Japanese Self Defense Force (JSDF) to access each other’s military bases for logistics support. Signing such an agreement would give the Indian military access to Japan’s base in Djibouti and the Japanese forces would in turn gain access to Indian military facilities on the Andaman and Nicobar Islands, in the Indian Ocean. But the implications of the pact would be beyond that as well, and it would be a huge boost to the India-Japan strategic partnership more widely too. A major handicap of geographical distance between India and Japan, and therefore the inability of the two sides to reach out in times of crisis and conflict, can be addressed quite effectively with such an arrangement. Therefore, it is no surprise that logistics and base sharing proposals were initially discussed at the annual defense ministers meeting held in New Delhi earlier this year. Speaking to reporters after that meeting, Japanese Defense Minister Itsunori Onodera said, “The (early) conclusion of the bilateral ACSA is important for creating an environment to allow the SDF and the Indian military to conduct sufficient joint exercises.” This agreement will indeed expand the military reach for the two navies across the Indian and Pacific Oceans. The possible signing of a logistics agreement and the increasing number of military and security engagements between India and Japan are clear attempts at balancing the growing Chinese muscle in the Indo-Pacific region. The relations have seen a big boost with Abe and Modi at the helm. With both leaders likely to stay in power for a few more years, the prospects for India-Japan security and defense relations continue to remain quite good.